​My name is Max Cichanowicz, but most people call me Chicky. I'm the best anchor on Soho Tv, and I aspire to be like Bartolo Colón. Also, Anakin is the most competent person in the program. ​This is my first year in SOHO TV and I’m loving it. Watch out News 12, I’m coming after you!!! I make the magic happen. This is my second year in SohoTV and I️ love it more than I️ love myself. I’ve made many packages and I’m looking forward to a great year! Tyler is junior at Southold. He enjoys surfcasting, spearfishing, and endless apps at Fridays. This is Tyler’s first year in Soho TV and he is excited to learn all of the necessary steps in making a TV show. Loves to be on camera! A dancer who is anything but shy! Anchor last year on the Jr high Takeover! Robbie is a junior who runs cross country and sails. This is his second year taking Soho TV, but he has admired the program since its inception. He enjoys being a co-producer and looks forward to improving his camera skills. This is my first year in SOHO TV and I am enjoying it. I like being on camera but I also like being the cameraman. I am looking forward to being in this class everyday. I’m a senior here at Southold. I’m captain of the Varsity Boys Basketball team. My favorite color is maroon, and summer is my favorite season. ​I'm Michael Jimenez, a senior here in Southold. I did SOHO TV last year and I really enjoyed it. My favorite part was filming each package. It was really enjoyable and I strongly recommend taking this class. I'm hoping to continue making great packages throughout the rest of my time in Southold. Hi. I'm Kate Jones, a violin player in 10th grade. This is my second year being in Soho TV and I hope to continue for years to come. Hi, I’m Alex Kandora and I'm a senior at Southold High School. I am looking forward to working with the cameras and equipment to help produce content for Soho TV. I play tennis and soccer. I’m president of Southold’s Robotics club. Now, I’m part of Soho TV. ​Colin McCarthy is a junior in Southold High School. He enjoys being an on-camera personality for Soho TV and loves going to the beach. Colin is also bilingual and is an avid traveler. ​Matt is a freshman here in Southold and it is his first year in Soho TV. He enjoys tennis, bowling, golf and getting good grades. 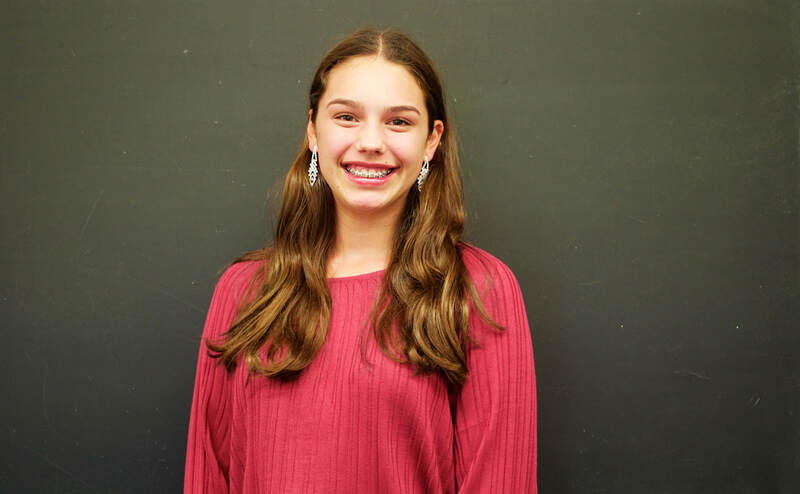 Juliet Rand is a ninth grader at Southold High School. She is a member of the North Fork Academy of Dance Competition Team. She is an active member of the music department. She has preformed in Mary Poppins, Le Misérables, Sabrina Fair and is the piano player for the jazz band. She takes private piano and organ lessons. In addition, she is a student at the Southold Opera House and has preformed in La Bohème with members of the Long Island Opera Company at the Southold Opera House and the Westhampton Beach Preforming Arts Center. Dante Tramontana is a junior and it is his first year in Soho tv. He enjoys football, and … well… yeah. Dante looks forward to working on this program. Also, Anakin is the most competent person in the program. ​Ben is a freshmen in Southold and is undoubtedly a nerd. He enjoys tennis, biology and does triangle proofs for fun. He and Matt Mullen make up the dream team in SOHO TV. You may know Ben as the Voice of Southold. If not, you really need to wake up in first period. Anyway, Ben is very excited to be a part of SOHO TV this year and aspires to do great things!